Silver Topaz is an eye-clean, colourless, and brilliantly sparkling stone. In ancient times just about any stone was likely to be called a Topaz. It is thought that the word Topaz is either derived from the Sanskrit word "tapas" meaning fire or "topazioz", a Greek word meaning "to guess". 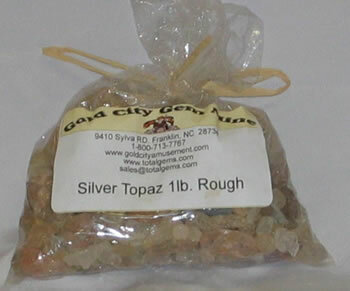 This 1 pound bag may contain stone from 1/4 inch to a full 1 inch.